An analysis by Sandia National Lab in Livermore, California indicates hydrogen fuel cells offer an economical and environmentally feasible alternative for powering commercial ships docked in seaports. Sandia Lab, a division of the U.S. Department of Energy, published the study, conducted for the department’s Office of Energy Efficiency and Renewable Energy, earlier this year. Ships docked in port are powered either by their own on-board diesel engines or plug into electric power from the grid where docked, a practice called cold-ironing. Running on-board diesel engines with high-sulphur maritime fuels accounts for one-third to one-half of the air pollution at seaports; a 2004 study from the Natural Resources Defense Council says diesel emissions at a busy seaport are equivalent to the emissions from 500,000 vehicles. Cold-ironing reduces or eliminates the need for on-board diesel engines, but just shifts the power load to the grid and increases the load on and emissions from local power plants. The practice is also expensive. Sandia’s Joe Pratt, the lead author of the study, says installing the infrastructure for cold-ironing can cost a port — and eventually the shipping lines — $5 to $10 million per berth. Pratt and Sandia colleague Aaron Harris evaluated a cold-ironing strategy that takes power from a hydrogen fuel cell using proton exchange membrane technology, where a thin polymer membrane separates the anode and cathode. Hydrogen flows into the fuel cell to the anode, where it is split into hydrogen ions (protons) that flow through the membrane to the cathode, and electrons that flow to an external circuit as electric power. The fuel cell takes oxygen from the air and combines with the hydrogen ions to produce water. The fuel cell envisioned by the Sandia team would be mounted on a barge, with a separate hydrogen fuel tank. The researchers calculate two fuel cells and hydrogen sources could readily fit in four 40-foot shipping containers on a typical barge, and power a container ship requiring 1.4 megawatts over 48 hours. Placing fuel cells on barges would eliminate the need for ports to build an electric power infrastructure. The barges could also be moved to the berths where ships were docked, or even ships anchored in the harbor waiting for berth space. The Sandia researchers visited ports on the U.S. West Coast from Tacoma, Washington, to Long Beach, California, as well as Honolulu. They found little use of grid-based cold-ironing in Washington and Oregon, and thus the fuel cells could have significant economic and environmental benefits. 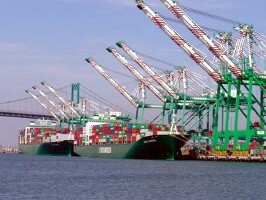 The California ports instituted grid-based cold ironing several years ago to meet emission-control requirements, thus fuel cells there would have less of an impact. In Honolulu, the port already uses diesel engines on barges, and fuel cells would help reduce its high diesel costs. Sandia is setting up a demonstration project with the Honolulu port to provide fuel cells to provide auxiliary power, for functions such as refrigeration. Pratt and Harris showed that at today’s prices for hydrogen — about $4.00 per kilogram — fuel cells were cost-competitive with diesel-fueled combustion engines. Even if the price increased to $5.00 per kilogram, say thje researchers, each fuel cell would still save a port tens of thousands of dollars. Pratt tells more about the study in the following video.